Here's some impressive planetary perspective: Last Wednesday, NASA's Kepler mission announced the discovery of 715 newly confirmed exoplanets, nearly doubling the total number of verified planets beyond our solar system. 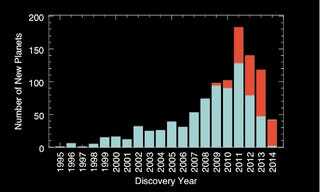 This animated graph, courtesy of NASA, helps put that discovery into context. Nothing like having to dramatically adjust the scale of your Y-axis to accommodate new results. Go Kepler!